It is not unheard of for the church to have restrictions on proselyting. Students attending the BYU Jerusalem Center for Near Eastern Studies abide by a strict “no proselyting” rule due to stipulations of the church’s lease. Other areas of the world are also off-limits to proselyting efforts for legal or other reasons. With humanitarian aid, unique factors necessitate proselyting restrictions. Sharon Eubank, director of LDS Charities, explained to BYU Students at a 2008 Kennedy Center address why tying proselyting to humanitarian efforts is problematic. At the time, she managed the LDS Humanitarian wheelchair program and supervised humanitarian couples and projects in the Middle East Africa North area. She used the experience of a wheelchair distribution in Latin America to illustrate. (Abt 5:08) They used young [proselyting] elders and sisters that were serving missions to help assemble the chairs: take them out of the boxes and put the footrests on, get them [ready]. But it was several blocks from the venue where the distribution was going to take place. As this was happening, of course crowds gathered and the missionaries decided, “Well, let’s sing!” So they started to sing “Called to Serve.” They’re pushing people in these wheelchairs up the road and they’re singing “Called to Serve” and somebody thought, “Well hey, there’s all these people on the side of the road!” So they passed out pass-a-long cards and literature and anyway, you can just see how this evolved with missionaries in their enthusiasm. (Abt 11:50) Imagine if you’re one of those people lining the streets. You’re watching these people you’ve never seen before in name tags and shirts pushing people with disabilities in these brand-new wheelchairs up the street and they’re singing, “Called to serve Him, heav’nly King of glory, Chosen e’er to witness for his name!” If you don’t have any background in the church, what does that sound like to you? And how’d they get those chairs anyway? Do they have to join the church? And you probably think so because somebody handed you a pass-a-long card as you were looking at the whole event. Sister Eubank was adamant that for the church to maximize their ability to perform humanitarian aid, proselyting missionary work had to remain in a separate sphere. (Abt 7:30) You can’t tie the proselyting work, that we believe in and we actively do, to the humanitarian work, that we also actively believe in and do. Because if you do, [the humanitarian work] loses it’s credibility. It becomes tainted in a way that it can’t be sustained. And, after awhile, we won’t have access and we won’t be able to do humanitarian work if it’s seen as a vehicle for us to proselyte. Those two things have to stay separate in the church. It’s one of the main principles. There can’t be any strings attached when we give humanitarian aid, and, hopefully, when we do it right there aren’t any strings attached. By disassociating itself from the proselyting effort, the church’s humanitarian aid resources are utilized by more agencies worldwide. A little over a year ago I heard about unusual aid provided by LDS Charities. Someone who’d participated in the effort shared her experience in a Relief Society class. In late 2014 ISIS initiated genocide against the Yazidi ethno-religious group of Northern Iraq. 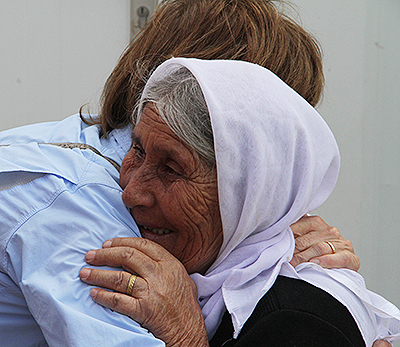 The LDS church assisted several other relief organizations in the set-up and management of refugee camps, providing medical supplies, equipment, and food. The sister who related the story explained that members of the relief organization in charge (not LDS Charities) became frustrated at the refusal of Yazidi women to accept fresh clothing. These women, along with others, had literally left their homes with only the clothes on their back, escaping from forced conversions, massacres, and sexual slavery. It took the charitable workers some time, but they eventually understood the traditional dresses of Yazidi women were part of their religious identity. Due to the unique design and religious meaning the dresses had to be handmade, which posed a problem for workers who needed a large number of dresses manufactured quickly. Eventually a solution was found, and the dresses were sewn by volunteers according to the individual specifications of the Yazidi refugees (using materials donated by LDS Charities). I loved hearing this story in a Relief Society lesson. I felt so proud that our church had identified such a unique need, and that we helped people maintain their religious identity. In view of our beliefs and practices, we understand how important religious clothing can be in worship. Then something happened. A Relief Society sister remarked how unfortunate it was that we were not allowed to share the gospel with them. She was sad that we couldn’t proselyte… to a group that was fleeing massacres and sexual slavery because of their religion. As the general women’s session reminded us, Mormon refugees escaping religious persecution were indebted to the citizens of Quincy, Illinois. The small town of 1,500 embraced 5,000 Mormons, helping them survive the winter of 1838-1839. Their help allowed us to regroup and establish a new city at Nauvoo, where we could freely practice our religious beliefs (for a few years, anyway). How would we view Quincy if those citizens had attempted to convert us to their beliefs while giving aid? (Abt 6:57) In our doctrine we believe our salvation is somehow inextricably tied with the salvation of other people. Not just people in our church, but everybody in the world. So we are commanded that our salvation has to do with how we look after the poor and the needy. And that’s the reason the church does humanitarian work. We hope that we do it in a way that shows we are Christian, and that we believe in Christian principles, but we’re going to do the work anyway. Whether people believe we’re Christians doing it or not, that’s not the reason we do the work. We will do it regardless. Do you feel proselyting should be allowed in some types of large-scale LDS humanitarian work? If so, under what conditions? Do you think the women’s session video about the friendship between a Mormon and a Muslim indirectly addressed this issue? Should any of these concerns between proselyting and humanitarian aid apply to individual members participating in non-church-sponsored projects? Peggy Fletcher Stack also reported on Shumway’s post in the Salt Lake Tribune. In May 2015, Yair Rosenberg, an Israeli journalist, wrote an informative piece on the history of the conflict surrounding the establishment of the BYU Jerusalem Center resulting in the non-proselyting clause. Next Next post: What is Evil? I’ve seen too much tainted. Agree with separation of proselyting and service. Glad it is bring emphasized. It is like people thinking we will only be their friends if they are listening to the missionaries. Friendship can’t be tied to something else. Service can’t be tied to something else. BYU Jerusalem students can’t proselytize… But what are you going to do about the light in their eyes? Isn’t Sister Eubank great? I love her vision and example. There are other places where the church is not proselyting. The young missionaries assigned to Turkey are not allowed to even wear name tags. They actively look for service opportunities. Missionaries in Muslim Indonesia can wear name tags, but they can’t tract. My introvert husband spent days wandering around hoping people would strike up a conversation. And they were very long days, too–foreigners were required to hire a local cook and maid/houseboy, which sounds like a cushy mission until you realize it means two more hours a day available to work. In Indonesia, when they hold a ceremony with local officials to open a new well or paved road or fish farm or whatever the church has done, the church leader present gives a talk that quotes from both the Quoran and Bible. In an area I served in my mission, the Bishop required that anyone who was receiving church welfare and was not a member, was required to meet with the missionaries weekly. This resulted in us spending a lot of time teaching lessons to people who were angry that we were there and felt like we were holding their bare necessities hostage. There was absolutely no way those families were ever going to actually listen to the message we were sharing. One of them even fed the Book of Mormon we had given them to their dog because they were so angry about the whole situation. It was a terrible idea. I wish we could have just helped those families with no strings attached. Then they would have retained a positive view of Mormons instead of hating us. Completely agree with the no proselyting policy. And, knowing Mormon culture, you can’t just say it once, you’ve got to beat peopole over the head with it, because in most LDS contexts proselying is *always* a good and righteous thing to do. Another, minor, practical consideration: If we give refugees the impression that there is a quid pro quo element to our aid, that to get it they should become members, I would guess that many would quickly become members for that reason and on that basis. Our resources aren’t set up to absorb that kind of quick infusion of masses of desperately needy people.There would be serious unintended consequences if we turned humanitarian aid into a proselyting grab. +10,000 Mary Ann! The wheelchair story was money. I’ve seen this kind of thing in all denominations and it really irks me. The classic is homeless people who “tolerate” praying and singing hymns to get a hot meal and a bed. It shouldn’t be that way. I’ve often wondered how many unfortunate folks sign up for Mormon baptism in the hopes of getting *any* material benefit, then fall away a few weeks later. My wife became gun shy after living in Utah for a few years. People seemed all friendly, but then after a week or two, she inevitably got “the sales pitch”. It seemed to be the *only* reason people wanted to be friends. It really hurt her feelings, and she became distrustful. in most LDS contexts proselying is *always* a good and righteous thing to do. Seems a bit harsh, but I’m sure you’ll get some “likes” for it. I was amazed at the pushback I got from posting this on my Facebook page. Naismith, I love Sister Eubank. Thanks for sharing the examples from other countries. Joni, I adore President Faust but that quote of his… not so much. Someone always brings it up when I try to explain the no-proselyting thing at the Jerusalem Center, usually with that knowing smile that dismisses everything I’ve been trying to say. EBK, yikes. Definitely a good example of Sister Eubank’s point. Kevin, students going to the Jerusalem Center are often recently returned missionaries, so hitting them over the head repeatedly with the no-proselyting rule is something professors have gotten very good at. When I went there over a decade ago, they had to pull out all the stops – if you broke this rule (not just proselyting, but talking about the church in any way, shape, or form), you were sullying the name of the church, BYU, Elder Holland, and every president of the church and president of BYU that has recommitted to that lease agreement. The link about the Jerusalem Center in the footnotes has some insightful commentary on how worried current students are about breaking the rule. Elder Anderson, yeah, I grew up in Utah. For whatever reason, most of my closest friends were not members (though they usually had good stacks of BoMs somewhere in their room). At some point they usually felt the need to put out there that they weren’t planning on joining the church, just in case I was angling that way. Keeping religion off the table became a sign of respect. I didn’t try to convert them, and they didn’t call me brainwashed to my face. I whole heartedly agree that service and proselytizing remain separate. My Mission President ruined my mission for me and a few others by refusing to let us do what we were called to do……service only. To this very day I get angry when I think about it. I was lucky enough to get paired with another service missionary and we did service without anyone knowing. We had more interest in the church than with proselytizing, but that is not why we did it. We were health professionals before our missions and truly wanted to help those who were struggling with many issues. Our efforts put the church in a good spotlight also. Salt Lake leaders should have kept better track of how we were being utilized. It is a shame the program was stopped. I’m retired now, but back in the day, I found it most effective to tell people what I wanted them to do, but never *how* to do it. I figured out that if people knew I trusted them and *needed* them, they put their heart and soul into getting things done. I am sure if you’d been left alone to do your work, you’d have been happier, your mission prez would have been happier, and most importantly, the folks you were helping would be happier. That’s pretty much how it worked out for me. My Mormon friends–especially at work–were very cool. Since we were new to Utah, I was very curious about the culture, and I was lucky to have such kind friends to explain the ropes. I also loved trading fresh fruit, vegetables, and eggs and sharing all the good food. I miss that now that we’ve moved away. Great post Mary Ann. Totally agree. Totally disagree. The wheelchair story is how all of our missionaries should be serving their missions. Sometimes I wonder if the whole missionary program, particularly outside of the U.S.A., had been service only, how much more beloved the church might be. Think how much good we might have done rather than wearing out shoeleather,I wonder about the hours I spent on crazy ward missionary jags when I might have spent the little time I had on community projects. I no longer proselyte because of policies regarding LGBT issues which are inexplicable to non-members.